The OE-A (Organic and Printed Electronics Association), a working group within VDMA, looks to promote new technologies and visions in the area of organic and printed electronics through its annual OE-A Competition. 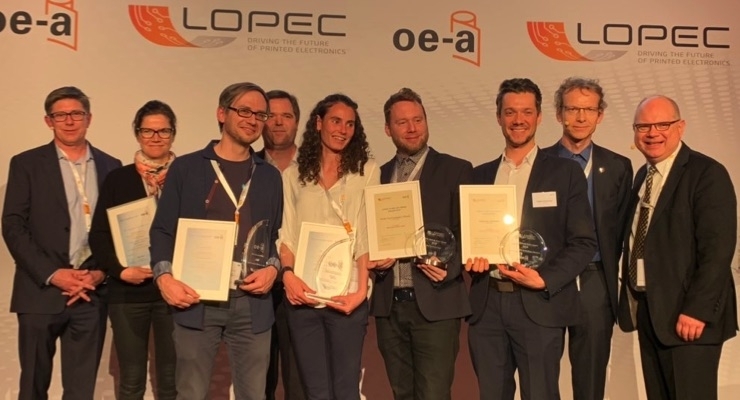 There were plenty of worthy submissions again this year, and LOPEC 2019, the international trade fair and conference for printed electronics, honored a few of these during its awards dinner. • Best Prototype/New Product - Self-Powered Glucometer, IMB-CNM-CSIC. • Best Freestyle Demonstrator - Project Monarch - OLED Design Kit, Fraunhofer FEP. • Best Publicly Funded Project Demonstrator - PYCSEL H2020 - Thin Thermal Fingerprint Sensor – CEA, Holst Centre/TNO, IMEC, et al. • Public Choice Award - Smart Windmill Blade – IPC & CEA Liten. • Best Business Case - Dr. David Forgacs, Saule Technologies. • Most Impactful Technology Product - Daniel Strohmayr, Tacterion. The honorees and presenters at the 2019 LOPEC Dinner & Award Show.